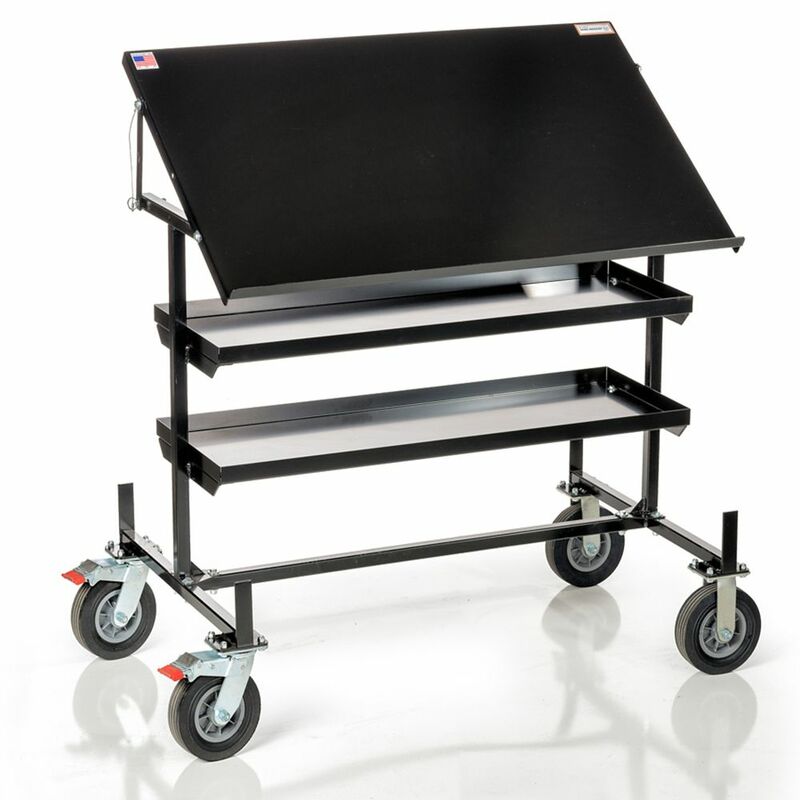 Wire Wagon<sup></sup> 550 is a mobile print table and work station with a conduit rack and material shelf, making this four pieces of equipment in one. This station saves time by keeping all of your materials together in one location, and allowing you to take your materials and plans directly to your work area. Double electrical knockouts, front and back, enable electrical service to be wired without cutting holes in frame. Heavy-gauge welded steel frame supports load capacities to 200 lbs. per sq.-ft., based on evenly distributed loads. 12 in. D steel lower shelf adds lateral support and stores shipping and packing supplies, tools, parts, etc. Gray powder-coated finish. Shipped unassembled. Enjoy more space for your projects. This 8 ft. wide workbench features a solid hardwood top with a 3,000-lb max distributed weight capacity. The heavy duty, welded steel legs feature a hammered white finish and adjust easily to provide the proper working height for any project. Wire Wagon 550, Mobile Print Table & Work Station Wire Wagon<sup></sup> 550 is a mobile print table and work station with a conduit rack and material shelf, making this four pieces of equipment in one. This station saves time by keeping all of your materials together in one location, and allowing you to take your materials and plans directly to your work area. Wire Wagon 550, Mobile Print Table & Work Station is rated 5.0 out of 5 by 1. Rated 5 out of 5 by Gator from Strong, sturdy and heavy duty The WW550 is a great Plan table, material storage and is easily moved around the project site. It is set up in about 30 minutes and then ready to use. I liked it so much, I purchased 8 more.